This entry was posted in "Thanks A Million", Bliss!, Generosities, Jazz Titans, Pay Attention!, Swing You Cats!, That Was Fun!, The Heroes Among Us, The Real Thing, The Things We Love, Wow! 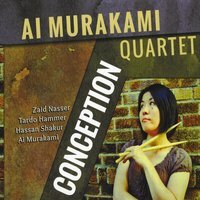 and tagged Ai Murakami, CONCEPTION, Gut String Records, Hassan Shakur, Jazz Lives, Michael Steinman, Tardo Hammer, Zaid Nasser. Bookmark the permalink. Michael,as you very well know,this music will never die,regardless of what ignorant remarks you alluded to.Ed Beach:was he a jazz disc jockey with lot’s of swinging radio notches on his programs? As for the featured group;i dig it,an alto player with obvious Bird roots and very cohesive to boot.